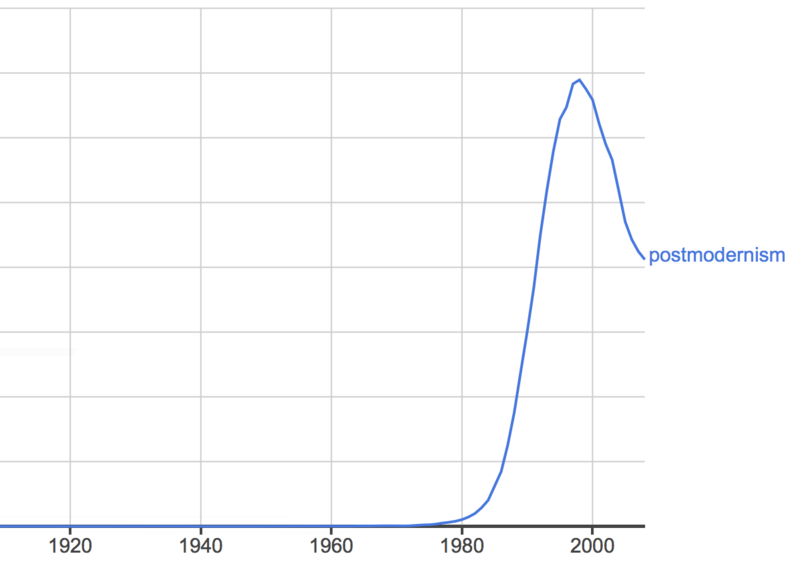 According to a search on Google Ngram, the term “postmodernism” reached its apogee in the 1990s. Then there was a sharp decline, at least in books up to 2008, which is the extent of the current Ngram database. “Postmodernism” seems to be a term used mostly by the far right in North America to describe what’s wrong with college-level (university) education. I attribute this revival of “postmodernism” in part to online media. Talks, presentations, interviews, seminars and talking heads, capture, replay and circulate complicated political, social and philosophical ideas as video clips on Youtube, and as podcasts. Books are out. That’s nothing new. The great intellects were often renowned for their lectures before they put their thoughts into print. The difference now is that it’s possible to be heard and seen by anyone with an Internet connection. A twenty minute viewing circumvents the need to read the book. The word cloud above is from several pages of search results. 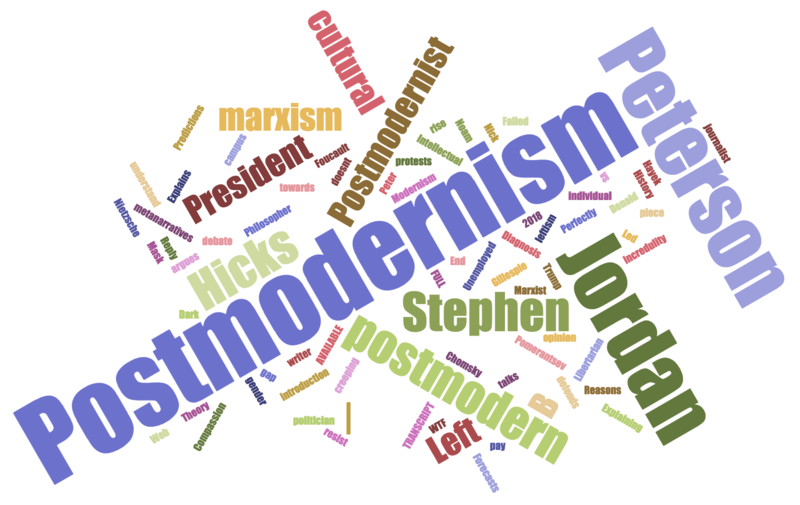 I think there are two ways that postmodernism has been picked up lately. Criticism of liberals, progressives and the left: For all its discourses about equality, fairness, minorities, unequal power relations, postmodernism restricts free speech, polarises, indoctrinates, imposes arbitrary “political correctness,” and is mostly incomprehensible. Criticism of conservatism and the right: Postmodernism is responsible for the current post-truth syndrome that brought Trump into power, where people have abandoned belief in reality or truth. So, you can say what you want and what works for you. Postmodernism has provided a climate in which we don’t know who or what to believe. As Trump said of the white supremacist march in Charlottesville last year: “there was blame on both sides, many sides.” Intellectuals have abandoned the rest of us to the mercies of charismatic demagogues and political snake-oil salesmen. The word cloud above shows that certain authors/speakers have risen to prominence of late. Here are some videos I viewed recently. The “stupid postmodernism” meme came from a short video about the Paul Manafort case by progressive independent news commentator, David Pakman: Paul Manfort will tell truth: Taken back MINUTES LATER. Jordan Peterson is a Canadian defender of conservatism. His Wikipedia site declares he’s a philosophical pragmatist (which I’m not so sure about), but also a fan of Ayn Rand, which certainly resonates with his defence of individualism: Jordan Peterson: Why You Have To Fight Postmodernism. A reasoned refutation of Jordan Peterson by a philosophical essayist going by the name of Cuck Philosophy: Jordan Peterson doesn’t understand postmodernism. A well reasoned case against Jordan Peterson by Ana Kasparian, an independent news commentator on The Young Turks: Ana Kasparian on Jordan Peterson. A surprising account by Noam Chomsky on postmodern obscurantism and his response to critics who accused him of being absolutist in his account of Middle East politics: Noam Chomsky – Postmodernism I. “Call it what you want: relativism, constructivism, deconstruction, postmodernism, critique. The idea is the same: Truth is not found, but made, and making truth means exercising power. Is post-truth politics a thing? Williams, Casey. 2017. Has trump stolen philosophy’s critical tools? The New York Times, 17 April. Available online: https://www.nytimes.com/2017/04/17/opinion/has-trump-stolen-philosophys-critical-tools.html (accessed 28 September, 2018). * opprobrium: disapproval, bringing disgrace.